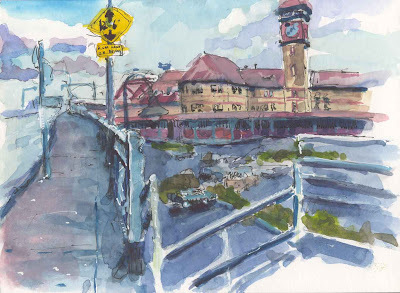 View of Portland's Union Train Station from the ramp onto the Broadway Bridge. Drawn in watercolor and black and white ink. nice perspective did you add the ink lines after ? Hi Isabel. I tend to start out with ink lines and then work back and forth with watercolor and ink until I ruin it.